If I had my dog's teeth, I would definitely not want to smile for a camera or anything else. No, I'm not suggesting he needs braces, although there is such a thing as pet orthodontics. But he does have a lot of tartar, a big problem for dogs and cats and, as they get older, the tartar gets worse... and so does their breath! Brushing the teeth of your pets helps to curb the buildup of plaque and tartar, but it's not often a pleasant task for you or your pet. Additionally, it doesn't get to the deep areas under the gums where tartar buildup can cause gingivitis, very common in dogs and cats. 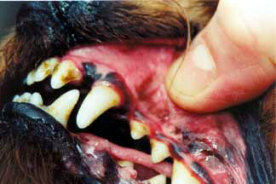 Veterinarians say that dogs and cats should have their teeth professionally cleaned at least once a year. 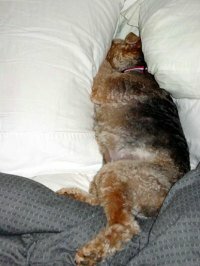 Unfortunately, to do a "proper cleaning," that is a deep scraping, the pet must be under general anesthesia. So teeth cleaning is an expensive and, at least somewhat, risky procedure. Available in Canada for more than a decade, but new to the U.S., Leba III is a product that promises to change the way pet teeth cleaning is performed. According to the LebaLabs, two to four sprays of Leba III per day in the pet's mouth can remove significant amounts of tartar without brushing or possibly even the yearly veterinary teeth scalings. You don't even brush your pet's teeth with Leba III... just spray it in your pet's mouth! The natural ingredients (distilled water, ethyl alcohol 25%, Lamiaceae and Rosaceae in trace amounts) work to change the chemistry of your pets' saliva so that the tartar softens and comes off. 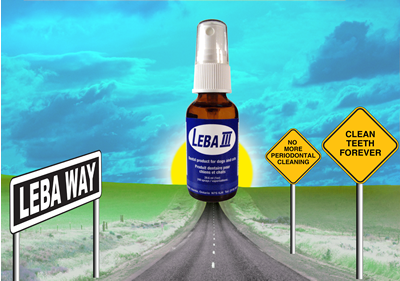 There are no side effects from Leba III except clean teeth and pleasant breath! Leba III underwent rigorous double blind studies prior to being marketed in Canada and there is evidence that Leba II does what it claims. On the website are several before and after photos, professional recommendations, and customer testimonials. 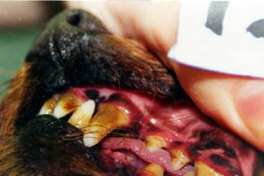 The following photos show a five-year-old dog's teeth before and after 28 days of Leba III applications. There is one minor inconvenience about this product... the price. Depending on the size of your pet, the 240 sprays in the one once bottle of Leba III can last from one to four months. The least expensive one ounce bottle I found was $56 at Best In Show Dog Supply. If you've tried Leba III for your pet, please let us know the results in the comments section below! False Teeth For Cats! What Next? Pro Pet Tip: 5 Tips For A Pet-Friendly Thanksgiving!